Everyone knows the movie scene. 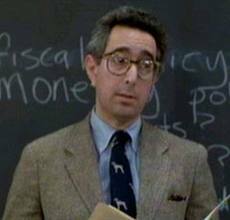 Ferris Bueller (Matthew Broderick) is not present in the classroom while the unknowing and charismatically challenged teacher (Ben Stein) drones “Bueller?… Bueller?…. Bueller?….”. Funny. 25 years later, some folks (including me) use the phrase with very present people when there is.…. no response. In some meetings and trainings, questions are never asked and comments are never made – it’s just silent. And “Bueller?..Bueller?…” is a means to get some response. Funny. But really, if you have to Bueller when people are present, don’t you have or are you, a problem? Mondays are busy. All posts are 100 words or less.